The Slate Pro Audio Dragon is an extremely versatile, well built and great sounding compressor/ limiter. Whether you work ITB, OTB or hybrid (combination of both) this compressor/limiter would be a great addition to your studio. Useful for both tracking and mixing. Link two for use on stereo groups/busses or master out of your favorite DAW. 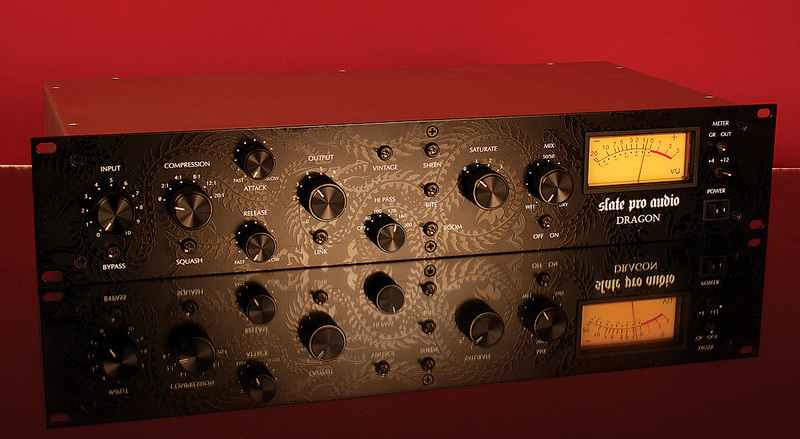 "The new SLATE PRO AUDIO DRAGON is unlike any dynamic audio processor you've heard before. Simply put, the DRAGON was created to be the most versatile compressor, limiter, and sound shaping tool that the pro audio industry has ever seen. The DRAGON starts with a classic FET compressor circuit, reminiscent of vintage units from the 60's and 70's. But the SLATE PRO AUDIO engineers enhanced the circuitry of the unit with a mastering grade signal path, including a CLASS A output section based around a custom-made transformer. The result is a compression quality that is rich and warm, but is also capable of sharp and aggressive tones. But this is only the start of what the DRAGON can do." "The Dragon is quite an unusual compressor because it offers so much in the way of additional tonal variation and saturation effects compared to most conventional units. With the Vintage, Sheen, Bite and Boom sound-mode switches, the Dragon can be set up with ease to provide anything from really quite crisp and sharp-sounding dynamic control on the one hand, right through to dark, warm and organic characters on the other — plus pretty much everything else in between. The mode switches all live up to their names very well too. Boom does indeed fill out that bottom end (although you’ll need full-range monitors and a good room to really appreciate the magic going on in the bottom octave) and Vintage brings that harmonic complexity associated with transformers and valves. Sheen really does smooth out the top end in a classic vintage opto-comp way, while Bite introduces an edge that really helps the source cut through." Audio demos of the Dragon can be found here. No matter which DAW you use attend this webinar featuring the great Mr. Filipetti himself. (Book of Mormon, James Taylor, Korn, Elton John) and Avid's Tony Cariddi for an insider's look at what it takes to be successful in the music industry. Hear about Frank's beginnings and how his experiences shaped his work and career path. Plus, Frank will be available during and after the webinar to answer your questions, soregister today and get ready to join the conversation. © 2011 Avid Technology, Inc. All rights reserved. Product features, specifications, system requirements and availability are subject to change without notice. Avid, the Avid logo, and other Avid trademarks are either registered trademarks or trademarks of Avid Technology, Inc. or its subsidiaries in the United States and/or other countries. All other trademarks contained herein are the property of their respective owners. All prices are USMSRP for the U.S. and Canada only and are subject to change without notice. Contact your local Avid office or reseller for prices outside the U.S. and Canada.